After working with Ashutosh Gowariker in film "What's Your Raashee?" 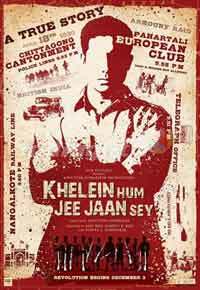 composer Sohail Sen teamed up with the filmmaker in period film "Khelein Hum Jee Jaan Sey". Packed with high energy and soft soothing melodious songs, the album is high on patriotic sentiment. It boasts of five originals. The film is based on Manini Chatterjee's book "Do and Die: The Chittagong Uprising 1930-34", and the composer has tried to stick to the theme of the movie in his songs. The first song of the album, "Yeh des hai mera", is a solo sung by Sohail. Even though the title is quite similar to "Yeh jo des hai mera" from Gowariker's previous film "Swades", the two songs are significantly different. "Yeh des hai mera" is a slow, calm, patriotic song and evokes feelings of encouragement. It is effortlessly sung by Sohail. A good start for the album. Next is "Nayan Tere". Crooned by Pamela Jain and Ranjini Jose, it has a certain amount of mischief and innocence in it owing to the lyrics and the way it has been rendered. The predominance of flute makes it melodious and hummable. In the end, a few lines in Bengali have been also incorporated to keep the soul of the film intact. The title track of the film is a high tempo, energetic number and what makes it a must hear is the vocals by children from the Suresh Wadkar Ajivasan Music Academy. The dynamism in the voice of these kids and the whistling are the highlight of the song. It oozes patriotism and is so contagious that listeners actually feel the emotion in the song. It has the potential to be a new freedom anthem for the youth. The only romantic track in the album is "Sapney salone", which has Sohail and Pamela behind the mike. A soft, pleasing and simple track, it has a tranquillising effect on listeners. Melodious composition and soft orchestration are the pluses of the love song. Then there is the much talked about Hindi version of the "Vande Mataram". It is also in chorus by singers from the Cine Singers Association Chorus Group. It is power-packed and energetic and evokes a feeling of love and pride for the country. The makers have also packed the background score of the film in the album under various titles like "Long live Chittagong", "The Teenagers Whistle", "Surjya's Sorrow", "Vande Mataram", "The Escape", "Nayan Tere (sad) and "Revolutinary Comrades". The music sticks to the theme of the film and yet it is entertaining and interesting. Sohail has tried to keep the orchestration subdued and has focused on vocals. Indian instruments like flute and sitar are widely used.